Chick Beck in Forty Minutes. Another bass tour de force from Stanley Clarke, this time featuring an all-star lineup that looks like a jazz readers’ poll for the year’s best artists: Jeff Beck, Chick Corea, George Duke, Steve Gadd, John McLaughlin, David Sancious, Lenny White. Journey To Love basically returns to the same approach as his last album: throw down some contagious funk, slip in a smooth-as-satin vocal song, add some old school jazz and class things up with a modern classical composition. The new wrinkle here is the addition of Duke and Beck. Clarke found a sympathetic partner in Duke, the two meshing like finely tuned and funky gears on the opening “Silly Putty” and “Hello Jeff,” the latter turbocharged with the electric guitar of Jeff Beck. David Sancious and Steve Gadd are also inspired choices, with Sancious playing lead and rhythm with equal aplomb. Maybe it was the presence of Duke, but Clarke takes on more complex arrangements on this album. “Concerto for Jazz/Rock Orchestra,” for example, features a full brass section that recalls Frank Zappa’s horny exploits (e.g., The Grand Wazoo) and stiches together several different parts with precision and skill. Compared to the concerto, the Corea-Clarke collaboration, “Song to John” (dedicated to John Coltrane), is a snooze. I get where the first part sounds like the shimmering and slowly unfolding sound of John’s later music, but the second part just sounds like Chick noodling around, and John McLaughlin’s acoustic guitar is a wet match that never lights. Still, it’s a minor complaint against a major work. Journey To Love continues to fill a special need for bass-driven jazz/rock. So few musicians were making (or were capable of making) music like this, and it’s easy to hear why many considered Clarke the instrument’s greatest champion. Together with his last and next albums, this represents a triumphant trio of jazz/rock that every bass aficionado (and plenty of pure music lovers) should own. All selections composed, arranged and conducted by Stanley Clarke unless noted. 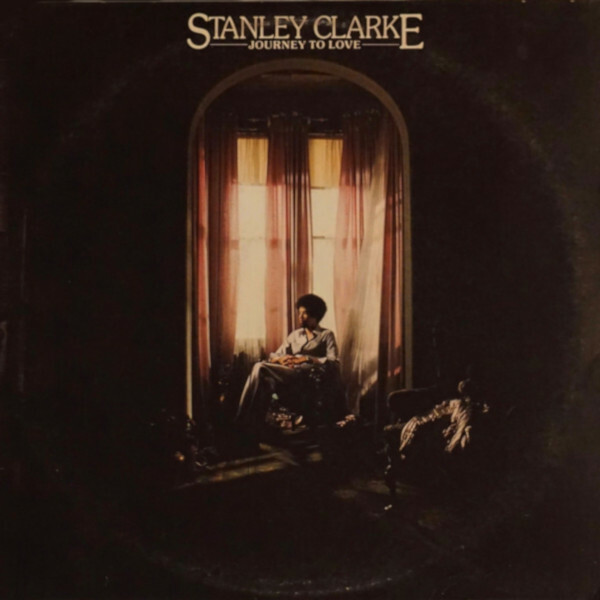 Stanley Clarke (Alembic electric bass, piccolo bass with Maestro synthesizer, acoustic bass, hand bells, tubular bells, organ, gong, vocals), George Duke (Mini Moog, ARP Odyssey, organ, ARP String Ensemble, clavinet, acoustic piano, electric piano, bells, vocals), Steve Gadd (drums, percussion), David Sancious (electric guitar, 12 string guitar) with Jeff Beck (electric guitar on A2/A3), brass section (Jon Faddis, Lewis M. Soloff, David Taylor, Peter Gordon, Allen Rubin, Thomas Malone, John Clark, Earl Chapin, Wilmer Wise), Chick Corea (acoustic piano on A4/B1), Mahavishnu John McLaughlin (acoustic guitar on A4/B1), Lenny White (drums on A3). Produced by Stanley Clarke & Ken Scott; engineered by Ken Scott. Photography by Steinbicker/Houghton. Art direction by Bob Defrin. Re-issued on elpee in the 80s in the UK (Epic, EPC 32093). Re-issued on elpee and compact disc in the US (Epic, PE/EK 36974). Re-issued on compact disc in 2008 in the US (Epic, 724150).